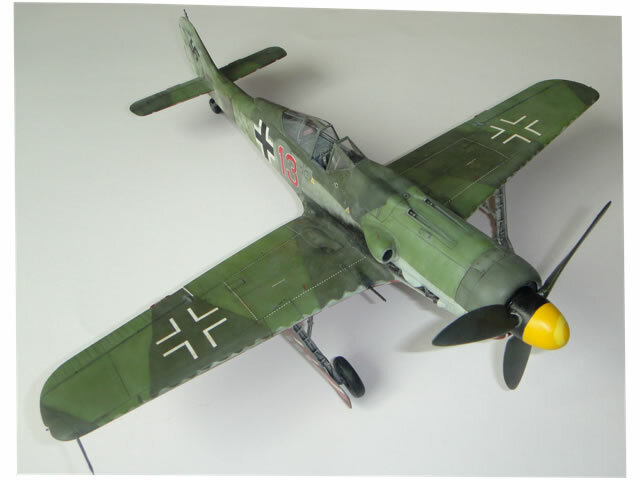 This is my recent built of Hasegawa's Focke Wulf Fw. 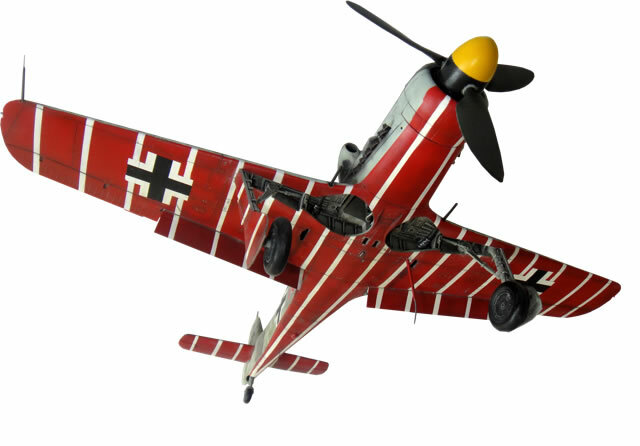 190D-9 "Dora" with EagleCals Decals representing the famous and always open to discussion (regarding the right colors and Werknummer especially) "Red 13" of the "Würger Staffel" (or "Butcher-Bird Squadron"). 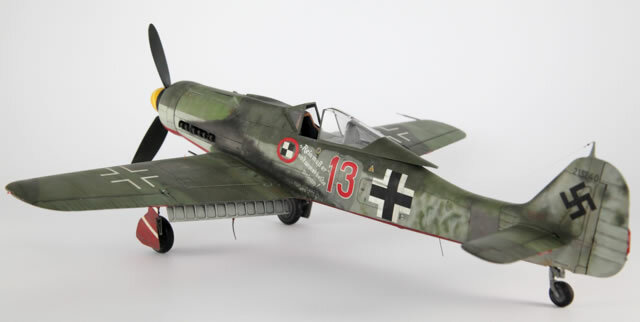 This Protection Squadron flew several cover missions protecting the airfields where the Me-262 of the JV44 saw action, providing air cover to the jets during the taking off and landing of the jets, critical moments for these planes due to the lack of performance of their engines at low speeds. Flying over the Me-262 and close to the ground, it was really important for this Protection Squadron to make easy for the anti-aircraft gunners, most of them young people without any experience, to recognize the friendly fighters from Mustangs or Thunderbolts flying around the airfield as "jet hunters". 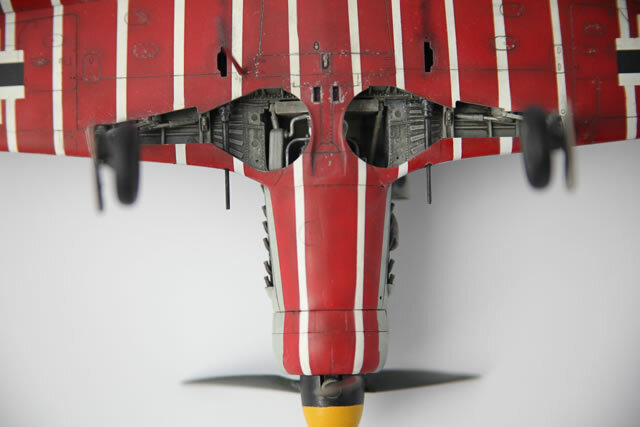 Nothing better than painting the under surfaces of the "Doras" in bright red, with hand painted white stripes. 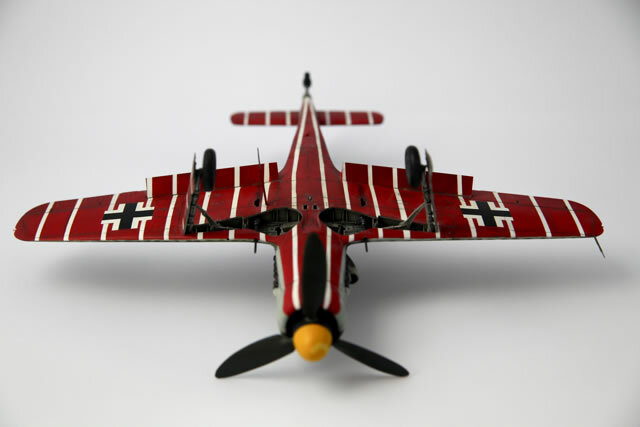 The result was probably the most colorful Squadron that flew with the Luftwaffe during WWII. No wonder that all manufactures have already produced JV44 "Doras" in all scales... and this bearing in mind that we only know of four Fw. 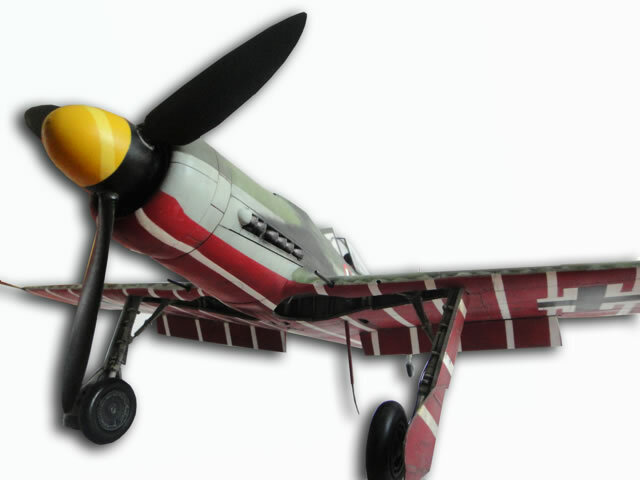 190D-9's that were flown by this unit!!! 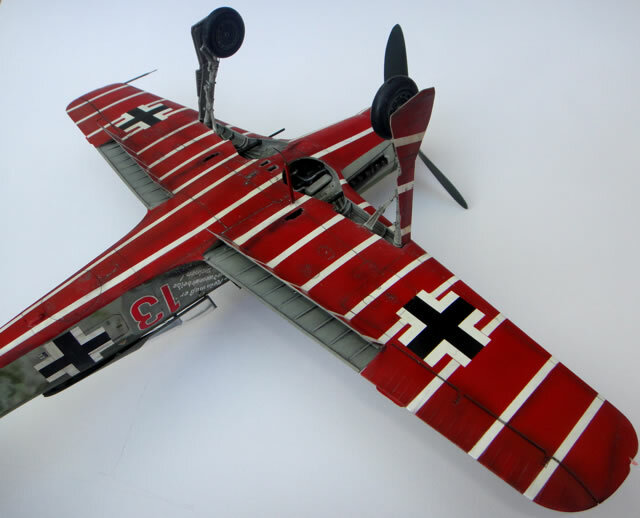 I built this Focke Wulf under commission for a professional photographer living in the North of Germany, who sent me as well (thank you Dirk!!!) many great pictures of my finished kit taken by him in his studio. 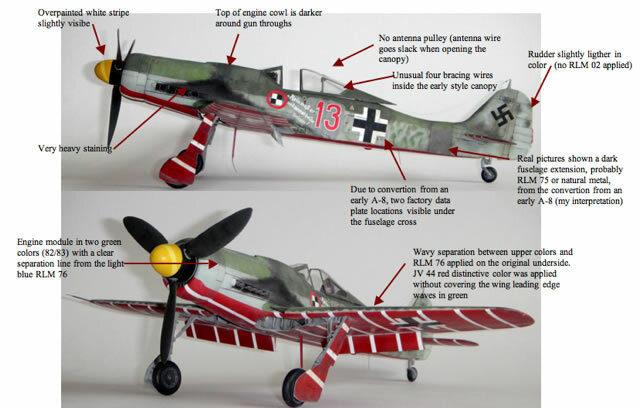 I was surprised to find many articles (JaPo and Jerry Crandall being the most detailed ones) about the real Serial Number or Werknummer of this fighter. The real colors are now confirmed as RLM82/83 (Jerry Crandall himself confirmed to me by email this fact). 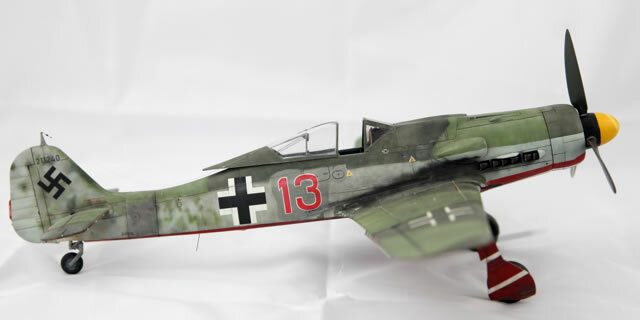 In opposite to the camouflage colors previously believed to be RLM75/83, this change from grey/green to all green made the project even more attractive for me! Who is right here? 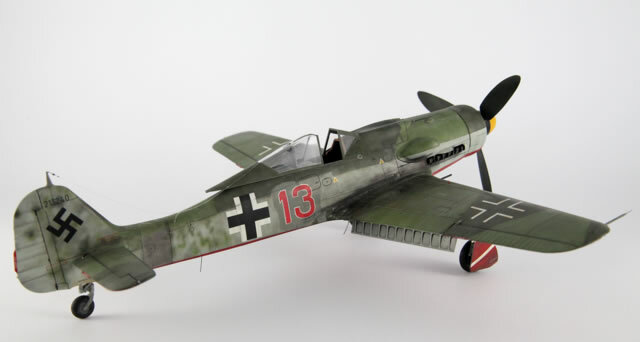 Well, working on Late War German Fighters on a base of black and white photos as reference, at the end it is up to your own interpretations of the different shades. 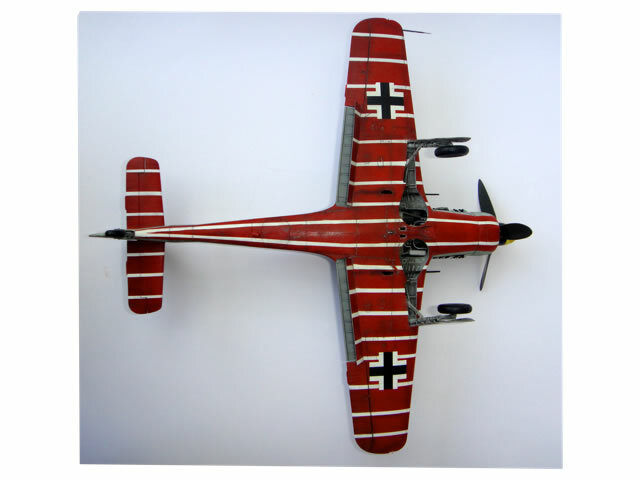 I went for the colors RLM82/83 as Jerry told me, and I also painted the fuselage extension in RLM75, typical sign of a recycled airframe (converting an A-8 into this D-9) as we can judge by the two data plates on the fuselage shown in many photos of this plane. I hope you like the results. 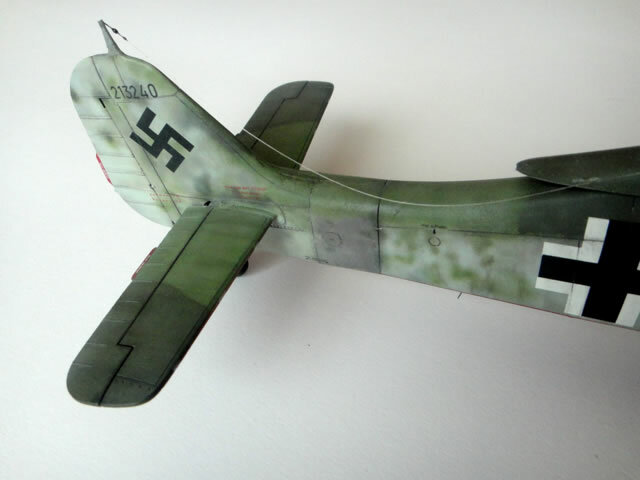 Dozens of step by step pictures of this project can be seen in my home website www.webmodelismo.com (in Spanish!). All the best and hope to come back to you soon with a new finished project!